You can put your mettle to the pedal and get around downtown Tampa on two wheels when you rent from Coast Bike Share. Tampa Bay&apos;s new bike share program kicked off Monday, Nov. 17, with Mayor Bob Buckhorn leading the pack on a short ride in Ybor City. The bike share system is open for anyone who have signed on as a member of the for-profit company. Non-members and tourists will get access to bikes starting Dec. 7. 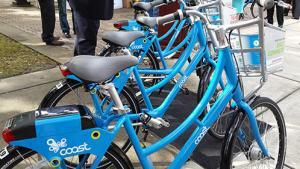 Renting from Coast Bike Share is a simple as swiping a credit card. Each bike comes with an on-board computer and GPS system to track both users and bikes. Make a stop by City Bike Tampa for a helmet, and you&apos;re ready to ride. The bikes are sturdy and built for getting around the city: a front basket keeps hands free, a draft shaft avoids the trouble of a greasy chain. Lights and reflectors increase safety at night. The City of Tampa has added miles of new bike lanes with more coming in downtown and the nearby neighborhoods -- Ybor City, Hyde Park, Davis Islands -- where Coast Bike Share operates. For off-street travel, try the Tampa Riverwalk or Bayshore Boulevard and enjoy Tampa Bay&apos;s best views from two wheels.